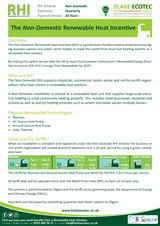 The Domestic RHI scheme was recently launched on April 9th 2014. It covers properties heated by a biomass system up to a maximum heat loss of 70kW. 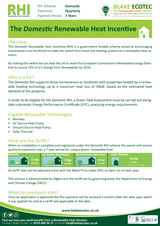 The scheme is available to home owners and those who have had renewable heat solutions installed since July 15th 2009. Payments per kWh are made over a seven year period and are made based on the estimated (deemed) heat demand of the property. 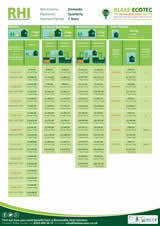 The Government's Green Deal offers aid to homeowners with the initial installation costs of a renewable heating solution. This allows people to pay for renewable heating solutions through RHI payments and the savings made on their future energy bills. kWh - Kilo Watt Hour - Tariffs correct as of: July 2015 Figures are estimations and for illustrative purposes only.